The best way to do that is either by creating a page by the company name and then posting various other recruitment’s in the page to focus the majority internet using the audience. Asking the employees to give their resume online can help the organization to filter many employees if they are not according to the need and deed of the organization. Keeping a track of individual employee or millennial is at times troublesome and this should be all organized in a very keen manner. By giving an attractive tag line regarding the company’s profile can help the majority of the millennial to be attracted towards them. This will help the millennial to know what sort of job they are being hired for what are the advantages and disadvantages associated with it and how to get into a place where there will be a help to the organization in various possible ways. The majority of the employee tends to appear in the company or get attracted towards it during their graduation and this is the reason they apply for some programs. Often it is important for the organization to keep updating their data timely so that there should be changes if any new recruitment is about to begin or if there arises a need to change the existing recruitment form from the company’s website if people are being hired from them. By maintaining the records what is being said is that every employee is being assigned for a particular task and if that task is being fulfilled proper updating should be made. By maintaining the record a company should keep track of the policies they will be performing. An organization should be keen enough to know what are the policies they will be declaring along with the other modules and keeping those policies is important as there should be proper maintenance of the people and the kind of work they will be doing. This becomes an important aspect in any company as the people or the menials working under them are very energetic and enthusiastic about their work so attention should give to them as and when required. Even if a particular millennial is not being shortlisted they shouldn’t treat them with disrespect rather they should appreciate them that there is always a bigger opportunity waiting for them to be executed. There should always be future scope for that persona and they should feel free to apply again when and wherever any job profile related to their interest comes into play. There should be proper ownership among the people already working in any company and they should focus on their work more precisely. The people appearing for the company should be well trained in the procedures that are about to come in the recruitment steps and should prepare well accordingly. They should have a keen knowledge of whatever they have studied or at least make an attempt that will help them to get through the job more easily and this will make the people regularity and they will tend to become more focused and prepared for the company and the people associated with them. There should be a spirit of the well and completely educated employees. There should be a good and healthy relationship between the individuals that will help the millennial to get through with the job. There always are some round and every individual has to go fully to every step one after the another and by gradually completing the task in the proper sequence that they have been placed they will finally meet the hr interviewer who will take interview of them and will ask them various questions that will help him serve its desired purpose. Before hiring any millennial one should be well acquainted with their family background and their internal factors and should help them making a decision based upon the kind of person they are and what sort of roles and responsibilities are best suited to them. There should be proper comfortless is every aspect related with the millennial and one should be very specific when it comes to hiring as they will eventually be serving for the growth of the company. Having a great culture that will serve the essence of the organization Is the need and deed for every organization. Today organizations are always in a zone where they are competition for something or the other for the sake of making their organization grow more. One must have such an organization that will help the individual to grow and should help the recruitment to carry along a vastness that will bring along a spirit of completeness in any company and eventually help them in their expansion. By showing the employees the actual deeds of the company will really help the individual to get attracted towards the brand and hence will strive or will give their cent percent to get into that particular company. By showing the work environment the millennial will get to see the attractiveness of the company and that will help him to evolve. A great working arena is the need of every company and every company should adopt it. They do not only help in making them feasible but also help in making them grow. Show the employees the future scope of the company they soon will be associated with. Show them how they can evolve both as a person and as a developer if they devote their time working in the company where both moral ethics and values are considered at the top most priority. By showing the millennial anything that includes a hell lot of money it will eventually attract the youth. They are money-centric people like the majority of the youth of their age are. This is one major thing that is covered in every organization. The way a thing tends to mind is of utmost importance and it should be done keeping the growth rate in mind. This will not only helping in getting the maximum number of people active for the company but will also help in serving people why they should target to such a company with such a numerous growth opportunity. This policy helps all the millennial get attracted towards them and this way it will serve its basic purpose. Growth is something that appeals both the people working for it and the people getting advantages from it. A company should focus on showing such behaviors that will create an image which will serve such a good quality of the company that they don’t fore people if they are not meeting the things they are supposed to meet rather they focus on improvement and give their 200% in improving them as much as they can by providing extra training if necessary so that the people can feel like home and perform their tasks. Learning from our previous faults and not repeating them in future is an important thing and every millennial should adopt it. They should be given full freedom when it comes to working hour. As they are all young and energetic they need their time for personal enjoyment and cherishing every time of their youth. This is something they are always worried about and giving such an extra free time as and when required to them is an important thing that helps them to grow as a person. Reward management is an important policy that now every company should adopt in order to get the maximum number of employees they tend to make this should be the utmost need for the growth of the company. If the people working on them are getting properly paid for the task they are being assigned and it will help them to perform mainly and this will help in creating such an environment that will keep a positive spirit and help people to grow. This is an important aspect and should be favored that will keep the people a company employee and the people associated with them happy as well as satisfied. To help them grow one must help everyone to accept the policies and should know what and how things will be moving that will help to keep all the relevant changed executed smoothly and very easily. Seeking the profit in the exact possible way will help everyone to grow. This should take place every now and then and there should be not any company that doesn’t flow such things. There are various advantages associated with off-line recruitment and this is important to keep a broad spectrum and this is the reason why millennial feel comfortable and they become eager to work for the company without any problem. Conducting off-line recruitment is important and proper attention should be given to help them grow in every aspect. If by chance any millennial failed to get selected in one of the procedure then she/he can compensate that by getting selected in some other. They should be highly professional and should maintain their dignity. 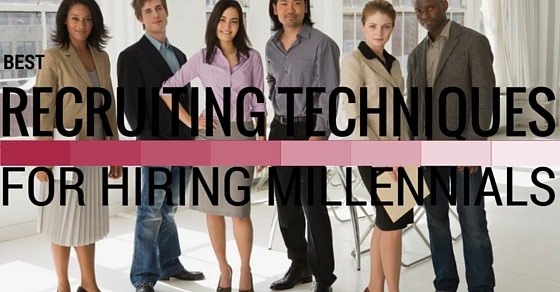 In order to conclude this, it is best that the best technique to hire any millennial is by being true to them completely. All they strive for is genuineness. They should feel happy and delighted to work in any company and should mark their presence in order to achieve their specific goals. They should be given equal rights and freedom where they can think, create and apply new and positive innovation in the company as and when they need. A company’s growth is first and foremost an essential need of any company and focus should be made on hiring the best to grow the most. Previous articleHow to Prepare for Customer Service Interview?